CENTRAL TRAINING AREA, Okinawa, Japan -- Outfitted in ballistics gear, a team of Marines slowly moves toward their objective waiting behind a protective shield for the command from their unit leader to explode through their entry point to arrest their suspect. Ten Marines from the Provost Marshal’s Office make-up such a team. The Special Reaction Team is specially trained to handle missions beyond the call of duty for basically trained military policemen. A military policeman is selected to be a member of SRT after he completes an indoctrination, which is an evaluation of how quickly he can learn the unit’s special tactics, Rowe explained. As the only military SRT on Okinawa, the unit constantly trains to hone the tightly knit team’s skills, often training six or seven days a week. “I wear a lot more protection than the other team members, so my job is pretty much to get shot,” said Cpl. Eddie L. Tesch, who serves as the SRT’s shield. After receiving the command to enter a room, two or more Marines buttonhook or cross into the room to either locate their objective or ensure it’s clear. “Once we dump into a room, we take it over as quickly as possible,” Rowe said. With danger around every corner, many men may not be fearless enough to be a member of such an elite squad. Though the SRT has not had a real-world situation to respond to for many years, that hasn’t stagnated their training. 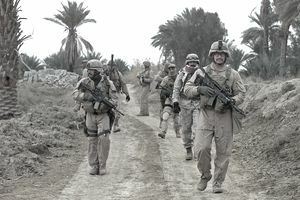 Regardless of whether or not the Marines have had a real-world situation to respond to in recent years, the team considers themselves a group of elite Marines. What Is the United States Marine Corps Chain of Command? What Is the Marine Corps Mounted Color Guard?